C.1900, Ansonia Royal Bonn "La Vogue" shelf clock in clean condition. There is a glaze crack extending out from the 11 to the left which is just visible in the photo. 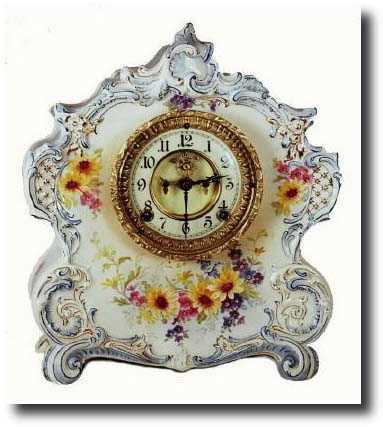 Otherwise, the clock is in very good condition, with perfect porcelain dial and attractive yellow and dark pink flowers. The open escapement movement is clean and running and with Ansonia multi piece pendulum. Bright trademark and model name on rear of case; original dust cover. Height 12 "